The Cincinnati Bearcats fell to 2-2 in the Big East and 11-5 by losing at Seton Hall. The Pirates improved to 10-5 and 1-3 in the Big East. The Cats jumped out to a 12 point lead, then proceeded to take stupid shots and turn the ball over and get beat. Seton Hall was powered by Jerermy Hazell's 33. The Bearcats were lead by Deonta Vaughn's 20. Vaughn once again got baskets late to build his total. Herb Pope nailed the game sealing freebies after UC cut the lead to 4 with 1:05 left. Lance Stephenson scored 15 in his return to New York. These are the types of games that you need to win, or you end up being a middle of the pack Big East team. 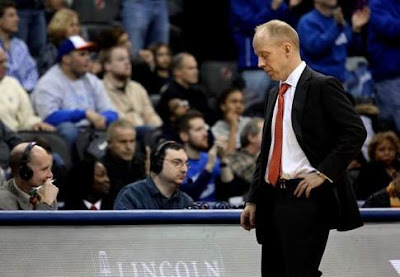 This was a bad day for Cincinnati sports, and Mick Cronin has the look we all had Saturday night.